I really like pasta. Brown rice pasta, whole wheat pasta, einkorn pasta, spelt pasta, sprouted pasta – even delicious, delicious white flour pasta. I don’t regard the white stuff as an enemy, but rather something to be enjoyed in moderation – organically grown, since the production processes connected with genetically modified wheat (specifically) do give me pause. Gnocchi, a potato-based pasta dumpling, is one of my favorites. 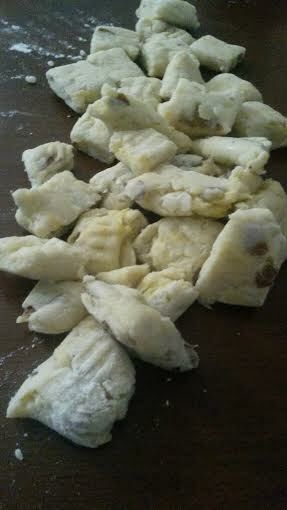 At a workshop last summer, I learned how absolutely simply and quickly you can make fresh gnocchi at home. It’s a fantastic way to use up leftover mashed potatoes (ha! ), and can be made with any kind of potatoes, sweet potatoes, or yams, as well as any kind of flour. Mix and match cooking, that’s what I like. If you’re not extra meticulous (I am not) you’ll be done in fifteen minutes, and your friends will think you’re amazing. I’ll never tell them how easy it was, if you don’t. 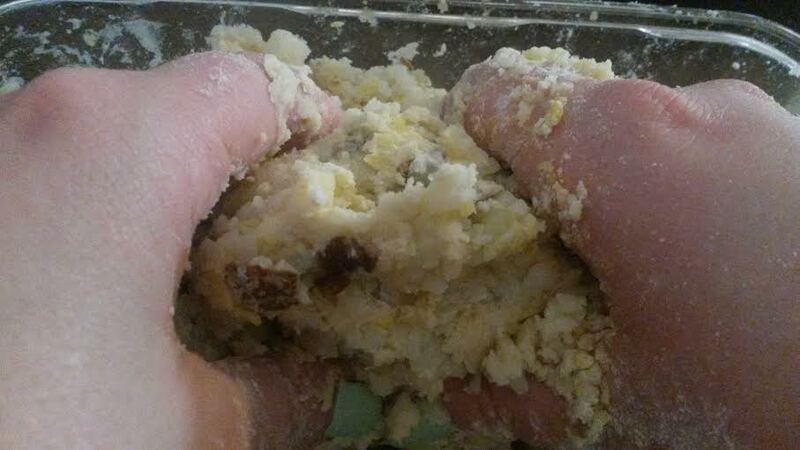 Two large russet potatoes, baked and smashed. 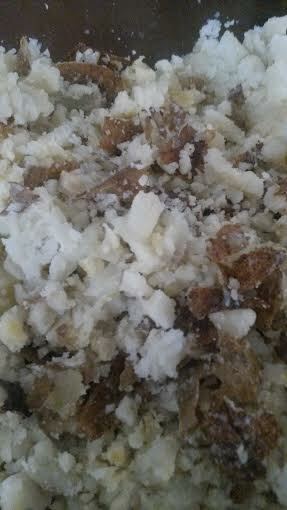 Mash two large, baked potatoes (cooled) or put some leftover mashed potatoes in a bowl. 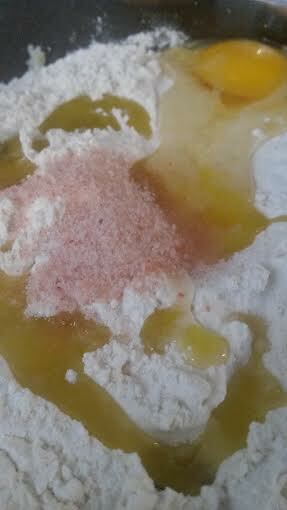 Add flour – just a little more flour than potatoes – along with 1 egg, no more than 2 T olive oil, and salt to taste. Get in there with your hands. Mix it up. Don’t handle it too much, though; this should be a quick mix. When the dough comes together in a sticky, gummy ball of sorts, it’s ready to be gnocchied. 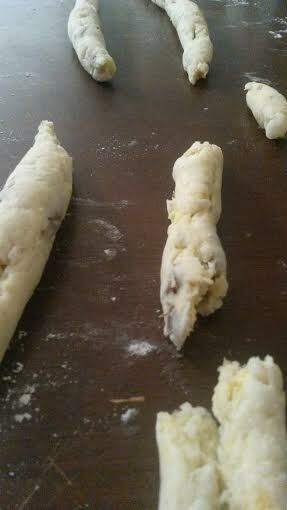 In batches, use your fingers to roll the dough out into cylinders about one inch across. Flour your working surface if you need to, though it may not be necessary. You can use a couple of different methods to create the individual bits. You can cut the dough into inch-long gnocchi, then roll each one up the side of a fork to impart those signature dents to the surface. 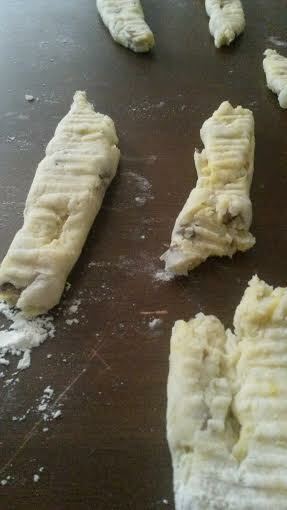 Alternately, you can press the fork into the dough at one-inch intervals, then cut it. The first method is the one used in my pasta-making class. The second method is what I did in these pictures, because I forgot about the first. There you go! You can really be as creative as you like here. I did a very basic russet potato and white flour version, but you feel free to go crazy. Add herbs or spices. Use purple potatoes or yams. Boil the gnocchi until they rise to the surface of the water, then toss or top them with your favorite sauce. I like them with browned butter and fried sage, or with olive oil, freshly minced garlic, and red chile flakes. Once at a restaurant, I had them in a cream sauce with shaved garlic and proscuitto. They’re also great with marinara. 12 Apr	This entry was published on April 12, 2015 at 12:41 pm. It’s filed under Collection and tagged eat local grown, fresh eggs, fresh gnocchi, gnocchi, gnocchi recipe, homemade gnocchi, italian food, non-gmo, organic, potato recipe, potatoes. Bookmark the permalink. Follow any comments here with the RSS feed for this post.